This article is about the American actor. For the singer, see Myka Relocate. 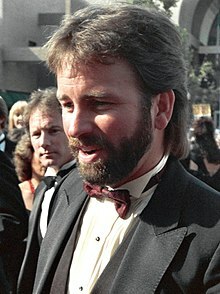 For other people, see John Ritter (disambiguation). Jonathan Southworth Ritter (September 17, 1948 – September 11, 2003) was an American comic actor. He was the son of the singing cowboy star Tex Ritter and the father of actors Jason and Tyler Ritter. Ritter is known for playing Jack Tripper on the ABC sitcom Three's Company (1977–1984), for which he received a Primetime Emmy Award and a Golden Globe Award in 1984. He briefly reprised the role on the spin-off Three's a Crowd, which aired for one season. Ritter appeared in over 100 films and television series combined and performed on Broadway, with roles including It (1990), Problem Child (1990), Problem Child 2 (1991), and Bad Santa in 2003 (his final live action film, which was dedicated to his memory). In 2002, Don Knotts called Ritter the "greatest physical comedian on the planet". His final roles include voicing the title character on the PBS children's program Clifford the Big Red Dog (2000–2003), for which he received four Daytime Emmy Award nominations, and as Paul Hennessy on the ABC sitcom 8 Simple Rules (2002–2003). Ritter was born at the Providence Saint Joseph Medical Center in Burbank, California, on September 17, 1948. Ritter had a birth defect known as a coloboma in his right eye. His father, Tex Ritter, was a singing cowboy /matinee star, and his mother, Dorothy Fay (née Southworth), was an actress. He had an older brother, Thomas Matthews "Tom" (born January 8, 1947). Ritter attended Hollywood High School, where he was student body president. He attended the University of Southern California and majored in psychology with plans to have a career in politics. He later changed his major to theater arts and attended the USC School of Dramatic Arts (formerly School of Theatre). Ritter was a member of Phi Gamma Delta fraternity at USC. While still in college, Ritter traveled to the United Kingdom, the Netherlands, and West Germany to perform in plays. Ritter graduated in 1971. Ritter headlined several stage performances. After his graduation from USC in 1970, his first TV acting experience was a campus revolutionary in the TV series Dan August starring Burt Reynolds and future Three's Company co-star Norman Fell. Ritter made his film debut in the 1971 Disney film The Barefoot Executive. He made guest appearances on the television series Hawaii Five-O, M*A*S*H, and many others. He had a recurring role as the Reverend Matthew Fordwick on the drama series The Waltons from October 1972 to December 1976. Since he was not a weekly cast member, he had time to pursue other roles, which he did until December 1976, when he left for a starring role in the hit ABC sitcom Three's Company (the Americanized version of the 1970s British Thames Television series Man About the House) in 1977. In 1978, Ritter played Ringo Starr's manager on the TV special Ringo. In 1982, Ritter provided the voice of Peter Dickinson in The Flight of Dragons. Ritter became a household name playing struggling culinary student Jack Tripper with two female roommates. Ritter co-starred opposite Joyce DeWitt and Suzanne Somers; however, Somers left due to a contractual dispute in 1981. Jenilee Harrison and then Priscilla Barnes filled Somers's role. Much of the comedy centered around Jack's pretending to be gay to keep the old-fashioned landlords appeased over the seemingly sordid living arrangements. The series spent several seasons near the top of the TV ratings in the U.S. before ending in 1984. A year-long spin-off Three's a Crowd ensued, as the Jack Tripper character has a live-in girlfriend and runs his own bistro. The original series has been seen continuously in reruns and is also available on DVD. During the run of Three's Company, Ritter also appeared in the films Hero at Large, Americathon, and They All Laughed. In 1986, he played the role of "Dad" in the music video for Graham Nash's song "Innocent Eyes" from the album of the same name. Hooperman was Ritter's first regular television role after Three's Company. Detective Harry Hooperman inherits a run-down apartment building and hires Susan Smith (Debrah Farentino) to run it. A relationship follows and Hooperman must juggle work, love, and the antics of Bijoux the dog. In 1988, John was nominated for both an Emmy Award and a Golden Globe Award for his work on Hooperman. Ritter won a People's Choice Award for this role. In 1992–95, Ritter returned to television for three seasons as John Hartman, aide to a U.S. Senator in Hearts Afire. This series starred Markie Post as Georgie Anne Lahti and Billy Bob Thornton as Billy Bob Davis. He also played Garry Lejeune / Roger Tramplemain in the production Noises Off in 1992. After his time on television, he appeared in a number of movies, most notably Problem Child and its first sequel. He played the lead role in Blake Edwards' 1989 film Skin Deep, appeared in the film version of Noises Off, rejoined Billy Bob Thornton in the Oscar-winning Sling Blade (playing a kindhearted, gay, discount-store manager), and co-starred with Olivier Gruner in the 1996 action film Mercenary. Ritter starred in many made-for-TV movies, including Gramps (1995), co-starring with Andy Griffith, Rob Hedden's The Colony (1995) with Hal Linden, Stephen King's It, Danielle Steel's Heartbeat with Polly Draper, and It Came From the Sky in 1999 with Yasmine Bleeth. Ritter also made guest appearances on TV shows, such as Felicity, Ally McBeal, Scrubs, Buffy the Vampire Slayer, and an episode of Law & Order: SVU (2002). John also provided the voice of the title character in the PBS animated children's show Clifford the Big Red Dog, a role for which he received four Emmy nominations. His final film was Stanley's Dinosaur Round-Up (2006), an animated direct-to-DVD film based on the television series, which was dedicated to his memory. At the time of his death he was starring in 8 Simple Rules for Dating My Teenage Daughter. Ritter played Claude Pichon in The Dinner Party (2000) at the Music Box Theatre on Broadway, which was written by Neil Simon. It ran for 364 performances. Ritter won the Theatre World Award in 2001 for his performance in that work. In 2003, Ritter made his final stage appearance in All About Eve, a star-studded benefit for the Actors' Fund of America held at the Ahmanson Theatre. In 1977, Ritter married actress Nancy Morgan, with whom he had three children: Jason (who first appeared in the opening credits of Three's Company), Carly, and Tyler. They divorced in 1996. He married actress Amy Yasbeck on September 18, 1999, at the Murphy Theatre in Wilmington, Ohio. They had a daughter Stella, born on September 11, 1998; in 2016, Stella adopted the name Noah Lee Ritter and self-identified as a trans man. Yasbeck played his love interest in the first two Problem Child movies. Yasbeck also played Ritter's wife in two sitcom appearances. In 1991, both were guest stars on The Cosby Show, in which Yasbeck played the in-labor wife of Ritter's basketball coach character. In 1996, Ritter guest-starred on Yasbeck's sitcom, Wings, as the estranged husband of Yasbeck's character, Casey. On September 11, 2003, Ritter suffered from heart problems while rehearsing for 8 Simple Rules for Dating My Teenage Daughter. He began sweating profusely and vomiting, and complained of having chest pains. He was taken across the street to the Providence Saint Joseph Medical Center, by coincidence the same hospital where he was born. Physicians treated Ritter for what they had diagnosed as a heart attack; however, his condition worsened. Physicians then diagnosed Ritter with an aortic dissection, a tear in the aorta that grows. Ritter died during surgery to repair the dissection, six days before his 55th birthday. 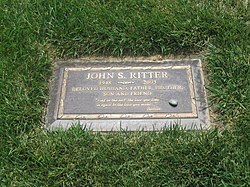 A private funeral was held on September 15, 2003, in Los Angeles, after which Ritter was interred at Forest Lawn, Hollywood Hills Cemetery in the Hollywood Hills of Los Angeles. In 2008, Amy Yasbeck (Ritter's wife) on behalf of herself and Ritter's children, filed lawsuits against doctors involved in Ritter's treatment and Providence St. Joseph Medical Center in Burbank, the hospital where he was seen. Some of the lawsuits were settled out of court, including a $9.4 million settlement with the hospital. However, a $67 million wrongful-death lawsuit against two of the physicians, radiologist Matthew Lotysch and cardiologist Joseph Lee, went to trial. Yasbeck accused Lee, who treated Ritter on the day of his death, of misdiagnosing his condition as a heart attack, and Lotysch, who had given him a full-body scan two years earlier, of failing at that time to detect an enlargement of Ritter's aorta. In 2008, at the Los Angeles County Superior Court, the jury concluded that the doctors who treated Ritter the day he died were not negligent and were not responsible for his death. Many of Ritter's co-workers expressed deep sorrow and heartbreak following the news of his death. Ritter's Three's Company co-star Suzanne Somers said: "I'm so sad for the family. We lost a good one, it was so unfinished". Zach Braff, who worked with Ritter on Scrubs, called Ritter a "comic hero" of his, and said he had approached series creator Bill Lawrence to get Ritter to play his TV father. Katey Sagal testified in the wrongful death lawsuit, calling Ritter a "funny man who was funny like nobody's business". His Three's Company co-star Joyce DeWitt remarked he was "impossible to forget. Impossible not to love". 8 Simple Rules for Dating My Teenage Daughter was later retitled 8 Simple Rules following Ritter's death and continued for one and a half more seasons until its cancellation in 2005. Ritter's character, Paul Hennessy, was said to have died after collapsing in a grocery store while buying milk. ABC aired the first three episodes of the show's second season that had been taped before his death, each of which was introduced by Katey Sagal. The remainder of the show dealt with the family trying to grapple with Paul's death. New male characters, played by James Garner and David Spade, were later added to the main cast as Ritter's replacements. Shortly before his death, Ritter had done a week-long taping with Hollywood Squares, which was aired as a tribute to him, introduced by Henry Winkler, the executive producer of the show and very close friend of Ritter's. Four days after Ritter's death, Nick at Nite ran an all-night Three's Company marathon dedicated to his memory. In 2004, Ritter was posthumously given an Emmy nomination for playing Paul Hennessy in 8 Simple Rules for Dating My Teenage Daughter, but lost to Kelsey Grammer for playing the title character of Frasier. Upon accepting his trophy, Grammer's remarks included comments made in tribute and remembrance of Ritter. Ritter's final films, Bad Santa and Clifford's Really Big Movie, along with an episode of Scrubs (his character in this series died, as well) and King of the Hill, were dedicated to his memory. On June 6, 2008, a mural of Ritter painted by Eloy Torrez was dedicated at Hollywood High School. In March 2010, the Thoracic Aortic Disease (TAD) Coalition, in partnership with Yasbeck and the John Ritter Foundation (JRF), announced the creation of the "Ritter Rules" which are life-saving reminders to recognize, treat, and prevent thoracic aortic dissection. The purpose of the JRF is to provide accurate information to the general public about the disease and its risk factors, provide support to individuals who have thoracic aortic disease or have lost a loved one to the disease, and improve the identification of individuals at risk for aortic dissections and the treatment of thoracic aortic disease through medical research. Yasbeck worked with the University of Texas Health Science Center at Houston (UTHealth) to establish the John Ritter Research Program in Aortic and Vascular Diseases with the goal of preventing premature deaths due to aortic dissection by identifying genetic mutations that predispose individuals to thoracic aortic aneurysms and dissections. 1990 Problem Child Benjamin 'Ben' Healy, Jr.
1991 Problem Child 2 Benjamin 'Ben' Healy, Jr.
1970 Dan August Coley Smith Episode: "Quadrangle for Death"
1973 Medical Center Ronnie Episode: "End of the Line"
M*A*S*H Pvt. Carter Episode: "Deal Me Out"
1974 Kojak Kenny Soames Episode: "Deliver Us Some Evil"
Owen Marshall: Counselor at Law Greg Episode: "To Keep and Bear Arms"
The Bob Newhart Show Dave Episode: "Sorry, Wrong Mother"
1975 Movin' On Casey Episode: "Landslide"
Mannix Cliff Elgin Episode: "Hardball"
The Bob Crane Show Hornbeck Episode: "Son of the Campus Capers"
Petrocelli John Oleson Episode: "Chain of Command"
Barnaby Jones Joe Rockwell Episode: "The Price of Terror"
The Streets of San Francisco John 'Johnny' Steiner Episode: "Murder by Proxy"
The Mary Tyler Moore Show Reverend Chatfield Episode: "Ted's Wedding"
The Rookies Hap Dawson Episode: "Reluctant Hero"
1976 Starsky & Hutch Tom Cole Episode: "The Hostages"
Phyllis Paul Jameson Episode: "The New Job"
1979 The Ropers Jack Tripper Episode: "The Party"
1980 The Associates Chick Episode: "The Censors"
1981 Insight Frankie Episode: "Little Miseries"
Pryor's Place Himself Episode: "The Showoff"
Life with Lucy Himself Episode: "Lucy Makes a Hit with John Ritter"
1991 The Cosby Show Ray Evans Episode: "Total Control"
The Larry Sanders Show Himself Episode: "Off Camera"
1994 Dave's World John Hartman Episode: "Please Won't You Be My Neighbor"
NewsRadio Dr. Frank Westford Episode: "The Shrink"
The Larry Sanders Show Himself Episode: "The Fourteenth Floor"
Wings Stuart Davenport Episode: "Love Overboard"
Dead Man's Gun Harry McDonacle Segment: "The Great McDonacle"
Over the Top Justin Talbot Episode: "The Nemesis"
Buffy the Vampire Slayer Ted Buchanan Episode: "Ted"
1999 Veronica's Closet Tim Episode: "Veronica's Favorite Year"
2000 Chicago Hope Joe Dysmerski Episode: "Simon Sez"
Batman Beyond Dr. David Wheeler Voice, Episode: "The Last Resort"
Family Law Father Andrews Episode: "Possession is Nine Tenths of the Law"
2001 Tucker Marty Episode: "Homewrecker for the Holidays"
2002 The Ellen Show Percy Moss Episode: "Gathering Moss"
Law & Order: Special Victims Unit Dr. Richard Manning Episode: "Monogamy"
Breaking News Lloyd Fuchs Episode: "Pilot"
1983: Star on the Walk of Fame – 6627 Hollywood Boulevard; he and Tex Ritter were the first father-and-son pair to be so honored in different categories. ^ Douglas Martin (13 September 2003). "John Ritter, 54, the Odd Man In 'Three's Company,' Is Dead". The New York Times. Retrieved 2008-03-17. 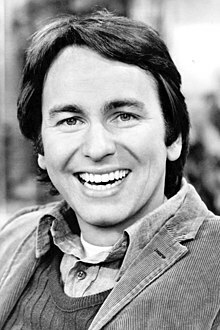 ^ a b "John Ritter: 1948–2003". people.com. September 18, 2003. p. 1. ^ Gliatto, Tom (September 29, 2003). "Wonderful Company". people.com. Archived from the original on December 3, 2013. ^ a b Lipton, Michael A. (December 16, 2002). "Acting His Age". people.com. Archived from the original on November 7, 2014. ^ "John Ritter Emmy Nominated". Emmys.com. 2003-09-12. Retrieved 2014-12-12. ^ Hodges, Ben; Willis, John A., eds. (1 Nov 2009). Theatre World 2008–2009: The Most Complete Record of the American Theatre. Hal Leonard Corporation. ISBN 978-1-4234-7369-5. ISSN 1088-4564. Retrieved 16 July 2013. ^ "Jason Ritter". Usmagazine.com. 2013-03-08. Retrieved 2014-12-12. ^ "Jason Ritter Biography". Tvguide.com. Retrieved 2014-12-12. ^ "John Ritter". CBS News. Page 5 of 17. Retrieved October 4, 2012. ^ "John Ritter". CBS News. Page 10 of 17. Retrieved October 4, 2012. ^ John Ritter Biography. Accessed 13 November 2014. ^ "Noah Lee Ritter: 5 Fast Facts You Need to Know". heavy.com. Retrieved 29 December 2018. ^ "John Ritter Legacy Lives in "Ritter Rules"". cbsnews.com. March 17, 2010. ^ Considine, Bob (February 4, 2008). "John Ritter's widow talks about wrongful death suit". today.com. ^ "John Ritter: 1948–2003". people.com. September 18, 2003. p. 2. ^ Grace, Francie (September 16, 2003). "John Ritter's Family Says Goodbye". cbsnews.com. ^ "Where Celebrities Are Buried In LA". cbslocal.com. September 30, 2013. ^ Charles Ornstein (2008-01-24). "Ritter's family says he didn't have to die". Los Angeles Times. Archived from the original on 2008-01-27. Retrieved 2008-02-29. ^ a b Deutsch, Linda (2 April 2008). "John Ritter's family seeks $67M in medical trial". Retrieved 7 November 2014. ^ "Associated Press" (2008-02-11). "Trial Begins Over John Ritter's Death". "ABC News". Archived from the original on 2013-07-17. Retrieved 2008-02-29. ^ "E! News – Jury Clears Ritter Doctors". Ca.eonline.com. Retrieved 2014-12-12. ^ Warner Bros. Online (2003-09-12). "Extratv.com : John Ritter Dies at 54". Telepixtvcgi.warnerbros.com. Retrieved 2013-01-20. ^ Hammel, Sara. "Katey Sagal Testifies in John Ritter's Wrongful Death Trial". People. ^ Jen Chung (2003-09-15). "Three's Company Marathon". Gothamist. Archived from the original on 2015-10-17. Retrieved 2012-09-16. ^ Tim Lammers (2004-09-20). "'Angels,' 'Sopranos' Win Big At Emmys". KGTV. Archived from the original on 2012-03-07. Retrieved 2008-02-29. I'd like to take a minute to pay respect to John Ritter and his family", Grammer said the actor who received a posthumous nomination in the category. "He was a terrific guy and his death was a shock to all of us. He will be missed not only for his kindness, but for his work. ^ "John Ritter photo added to mural". The Hollywood Reporter. Retrieved 2015-12-26. ^ . Retrieved 2017-9-21. "Features popular characters and voices from the hit TV show"
^ . Retrieved 2017-9-21. "Features:...Popular characters and voices from the hit TV show"
Yasbeck, Amy (2010). With Love and Laughter, John Ritter. ISBN 978-1-4165-9841-1. Wikimedia Commons has media related to John Ritter.